Happy September 1 but really, starting at 52 degrees? Isn’t that a bit drastic??? Add that it feels like 47 degrees and it’s no wonder the house feels like a walk-in freezer this morning. I’m a “windows open all the time” person but even I was chilled last night, to the point of getting out the duvet from the linen closet. Sheesh. Labor Day weekend is upon us. The Fox Lane school buses made a practice run this morning for next week’s start, the high school bus motors up the hill at 6:49. Poor kids who have to be up and out that early. We’re around this weekend. No great blowout Labor Day plans. The kids are busy with their families so I’ll be content to putter and futz around the yard, read, and walk. Could I be any more boring?? Happy September everyone! Summer sure blew through quickly. Our street is all back from vacation. The kids are moaning about school. The parents are thrilled. Big family BBQ this weekend for us. Burning papers in the fireplace – hardy-har-har-har. Ha ha. “Burning unidentified items”. Hillary’s email about yoga? I didn’t hear the dog last night but I had an awful night sleep so it might just have been I wasn’t hearing the dog, not that it wasn’t barking. I fell asleep way too early and woke up the first time before I normally go to bed! That was a bad sign. Then I was awake about every two hours after that, chilly but lazy to get the duvet, then got the duvet, then too warm, then strange dreams about a navy blue sweater Mr. EOS has that is pilling, then….then…get my drift? I’m slightly comatose today. Even comatose, you make more sense than half the internet. That’s funny. When WWTBAMillionaire started with Reeeeg as host, we’d watch every time, glued. It was a fantastic game. Now, a million failed hosts later, the show is still on but a shell of its former self. It’s like ABC is now airing old games revived with hosts like Michael Strahan. Jeez, Michael Strahan couldn’t muster hosting with Kelly Ripa, he’s the token straight guy on GMA, yet some TV exec thinks just anyone can host a game show? It’s a rare talent. The old timers, like Jack Narz and Bill Cullen and Bud Collyer. Then look back at the panelists of old game shows: Kitty Carlisle, Tom Poston, Steve Allen, Fred Allen, Bennett Cerf, Dorothy Kilgallen…. where the hell are all these brilliant minds today? They don’t seem to exist. I think Queen for a Day was the death knell. Climate Change my friend, climate change. I blame Al Gore, but he’s probably sitting poolside next to ex wife Tipper at their manse in Montecito about now, not a worry about the temps. Strahan strikes me as a diva. The way he left Kelly was unacceptable. The job he has at GMA is a joke and hosting game shows, it’s all an ego trip. He was a good NY Giant and I like his football anchoring but it stops there. I laughed out loud that Strahan sent out his love for Houston from aboard his yacht in Greece. Now that’s funny. We don’t have to agree on everything, but, we can agree on one thing, that we are Americans. I got weepy. That’s beautiful. Alas, some crazed haters even object to (white) people helping people. Go figure. Melania this morning heading to Texas wearing high heels, her giant FU to the haters. I love her. 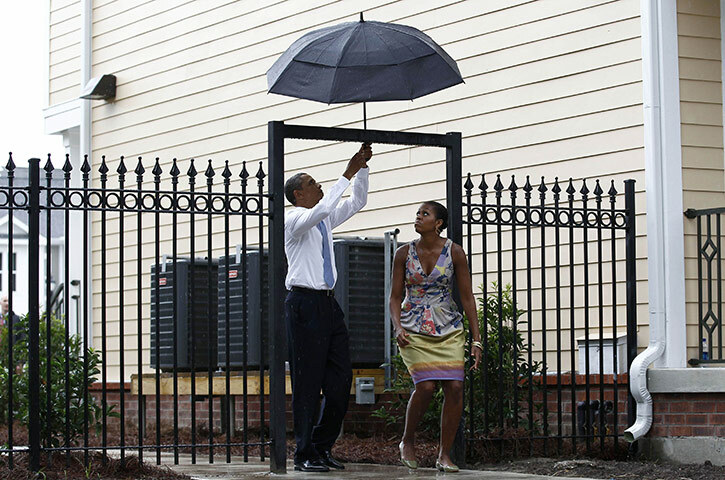 I think that’s one of the best Obama photos ever published. Thanks for the good laugh.